Personal and ConfidentialFirst and foremost your young folk, who have gone off with Dr. Grenfell for a week they have given us and many others here great joy. I daresay they have written to you about some of their experiences; but they couldnt write, for they dont know, how much pleasure they have given us. In one sense they have come in a dull time, but for that reason we have ourselves seen more of them; and, even when most of the great people are gone, theres a good deal of London left. All our friends have been greatly charmed by them. When they first came, I congratulated Frank; when they had been here a week I congratulated Jessie; when they went away the other day I congratulated them both.________And now comes the news of the Senates passing the Currency bill an unmatched record of one years legislation and leadership. Youve got now to a high tableland these two peaks surmounted; and I hope all the governmental and party prospect is pleasing. You may be sure of this here your hand is felt. When I first came here I encountered a good deal of curiosity about the personality and the qualities of the new President. Now I encounter the profoundest respect and constant congratulations. Its fairly amazing how quickly and accurately in this insular world of great ignorance about the United States, they measure up our real men. Sir Edward Grey and the Prime Minister have both this week said things to me about you that sound almost as if they knew something about our Government and the spirit of their our institutions & people. They are in a good temper and in a good mood, and Tyrell has come back in good time to help that. He tells me much about you and House and Houston. Ill tell you what I like about them, said he: they dont gush. Then he went on to say how you talked in the same phrases as their Liberal leaders here. They talked before me just as they talk to one another. It was a good stroke his going. When House comes over again, that, too, will be a good stroke. If only you shd see your way to come, as perhaps you may yet. ________The definite tasks now ahead of us here Each in its own good time are the Canal tolls and thereafter the renewal of the Arbitration treaty. They will now be quite patient. [I told Sir Edward the other say that we appreciated his patience about the Canal tolls, and your Minister to Mexico, I fear, has made it necessary for you to use patience still. He does not seem quite to understand in spite of your instructions. He made no reply. But I have seen to it that he had heard about Carden from some sources quite near him here. If only I could get anything definite that Carden has said or done, I could use it with good effect. My halfdozen requests for such information bring no reply whatever only the rhetorical assurance that we cannot believe he correctly represents the British Government. The one fact that I have received is that Carden remarked that the action of the U. S. was mere bluff. I have used that, and I have nothing more to use. ]Definite inquiries often come through my back door from the back door of other of our Embassies, on the continent, whether we have difficulty in getting definite information from Washington. I never answer them, but I fancy that answers go back from my backdoor to theirs. I have twice lately had to telegraph for more exact statements of instructions.________The peaceplan which has been carried out in treaties with several small Central American States will, I fear, if presented here, provoke the answer that a renewal of the Arbitration treaty shd come first. That is more definite, concrete, helpful. But, as I say, they are in a mood here to be quite patient. I am surprised, as I think it all over, at the number of reversals of positions they have made in the Mexican business , in the concessions business in everything we have asked. The San Francisco Fair decision is the only exception. That stands. The Governments declination to reopen the subject is, I am informed, due to local politics. It has become mixed up with their budget quarrels, and the Cabinet will not give money for anything not even100,000 that they can help giving. In this matter the trick was missed in the first place by the inefficient management here of the San Francisco Fair managementrs. There is much indignation expressed in the press at the Governments action, and some of the members of the British Committee say that a fight will be made for the Fair in Parliament, which convenes Feby 10. But there is now a general doubt expressed whether anything can be done. The domestic difficultiesUlster and other such things that the Government and Parliament have to encounter seem to me likely to prevent the Governments official representation at San Francisco. There will, of course, be individual British Exhibits how large and how important, I cannot tell. But, underneath all, the feeling of a large part of the public is that expositions have had their day. The very vigorous British agitation in behalf of the San Francisco Fair has its motive in a wish to please us. The U. S., they say, wishes us to go and that is a sufficient reason why we should go. As nearly as I can guess, the chance that the Government will be forced by Parliament to participate is small. As Christmas comes, I am glad to say that my diplomatic docket is entirely cleared up the slates clean, with only two problems in sight, so far as I can recall The Panama tolls and the British hope for a renewal of the Arbitration treaty at some early time; and, as I have said, about both these the Government is patient. About Carden, I can do no more without facts.The one thing that my mind works towards all the time is the hope of finding a chance to do something constructive, something that will stand out & last & be important in the relations of the two peoples. 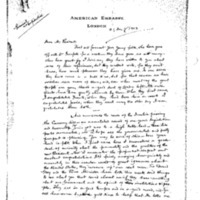 These relations are surely most satisfactory; but there is an immense amount of ignorance of the other on each side.The one great constructive thing, of course, that has come along is the Great Principle on wh we are proceeding in Mexico, the Principle a sort of in hoc signo whereby we shall save Central & South America for the behoof of the people who dwell there and win back their regard that brings the Monroe Doctrine down to date and translates it into modern terms. That has taken a firm hold on my imagination; and I lose no chance to try to make these people understand it. No, I do not know in any detail what our Government has said to other Governments, except what it has told this Government through me. I have thought it all out for myself the best I can; but I have a feeling that there must be large gaps in my information. It would be simply of incalculable benefit to us who are in the field if there were some man in the Department of State preferably some man, like William Phillips, who has served abroad whose business it was to keep us informed. I have, for instance, never heard a word about anything that has been said or done or discussed between the State Department and the British Ambassador at Washington. Perhaps theres been nothing. But, if this Government has ever given him any errand to our Government, I have never heard of it; and I sometimes feel that Sir Edward Grey feels my ignorance on this score. ________My life continues to be interesting and very busy and in every way pleasant. Its usefulness I sometimes doubt, because of the lack of definite constructive work. (Bryce reassures me and says that I am mistaken.) Then the vast silence across the ocean and a feeling of the rhetorical indefiniteness at the other end of the line give a feeling at times of a vast vagueness. Your letters, you may be sure, are always reassuring and most helpful. They are the only definite things I get. I am told, too, that this is always so perhaps it must be so. But that will be remedied presently, I know. For how big in more essential things are the great tasks you have done since March The Tariff act, the Currency act, the Principle of Saving Helpfulness touching Latin America, the preservation of the integrity of the consular service and of the rank & file of the diplomatic service (this has had a great good effect in every European capital), and the welding of the old hungry & growling party into an intelligent and loyal instrument of government. These achievements are so great and so fundamental that, in comparison, it would matter little if we had no diplomatic service. You will, therefore, never catch me complaining of any little sorrows of my own: if I had them, they wd not be worth airing; and I am most happy to serve.________During the last month I have made almost a speech a day most of them afterdinner speeches before such bodies as The Royal Society, the Economic Section of the University of London, The Authors Club, the Worshipful Company of Mercers, the Navy League and the like; and I have tried to present one idea in each little speech that shd give the company one clearcut notion of some part of the work of our great Democracy. They receive my commonplaces most heartily. I had the satisfaction of receiving the appreciative thanks of a group of judges of the higher courts, include the Lord Chief Justice, on an explanation of our Mexican policy. They had not before understood it at all. It requires a surgical operation to get so simple a principle into the British head: All this activity, I dare hope, helps a little. But its very slow, and its work as hard as it is pleasant. But all real life is an adventure, and this is adventurous enough, you may be sure. Ive worn two dress coats to a frazzle, the Lord knows how many pairs of of motortires and Ive been stopped for speeding. But Im too old a fox to eat their dinners or to drink their wines. Still, if the King lives as long as Ive toasted and sung him in my hopes of long life to him, hell be immortal. He must have got some inkling of it, for he sent me two brace of pheasants the other day.________Now all this is a rambling, and I fear, a dull letter meant only to do this: to convey my hearty congratulations and good wishes for some rest for yourself and for a Big New Year and many of them. PS Heres a rather good piece of news The English and the Germans, who own most of the ships, had been so running the SafetyAt Sea Conference that it became obvious that their report wd be merely a clean bill of health for all ships afloat. Several days ago Mr. Alexander ran across the Prime Minister at a luncheon, I think. Mr. Asquith askd him how the Conference was going. Alexander told him that it seemed doubtful whether the report wd be such that the American delegates would sign it. The Prime Minister evidently passed a word of caution and command along; for the very next day, things began to go differently. I heard that the Prime Minister said that the report must be one that the Americans wd sign I ran across old Lord Mersey at dinner about that time. He presides over the Conference and hes a sleek, fine old Law Lord who says startling things as gently as a sucking dove. He said to me, slyly smiling: Your Excellency, I have an observation to make to You about Your countrymen: They fight well Your Honble Mr. Alexander, for instance. Thank you, said I. ________Youll be pleased to hear, too, what the Lord Chancellor said to me about your daughter. He askd that pair & my daughter to dinner and his only other guest was Lord Morley. Those old fellows had a gay time with those young folk. The old Lord Chancellor (who lookd like a bigger Hoke Smith and (I sometimes fear) is more or less like him) said to me afterwards: A fine young lady, I like the breed. Page, Walter Hines, 1855-1918, “Walter Hines Page to Woodrow Wilson,” 1913 December 21, WWP18237, First Year Wilson Papers, Woodrow Wilson Presidential Library & Museum, Staunton, Virginia.